I'm back!! 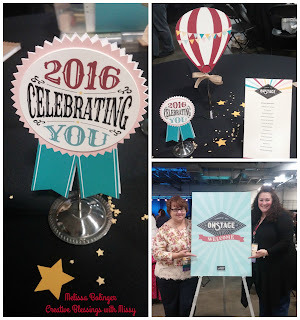 I spent the weekend in Secaucus, NJ attending OnStage - a training event hosted by Stampin' Up. What a fabulous weekend. Time connecting with friends from all over. A chance to see and create with NEW Products!! and Prize patrol. I came home with 4 new stamp sets from the upcoming Occasions Catalog that will be available in Jan. I've placed my order for several more new stamps sets, paper and embellishments tonight so I can start creating samples for upcoming classes and events. Can't wait to start showing you some sneak peeks later this week!! Loved the table decorations - Our theme was Celebrating YOU ! Bottom picture is my roommate for this event and friend Jenn who lives in CT.
Hope you have a creative day! Why do you love Stampin Up? Mother of four wonderful adult children and one grandson. I love being creative and creating for family and friends. I love the way Stampin' Up products coordinate and make it super easy to design and create!